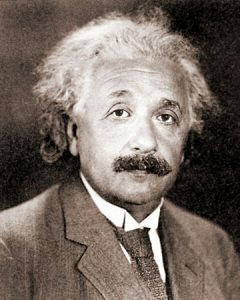 Raised in a family of non-observant Jews, Einstein attended a Catholic elementary school before entering Luitpold Gymnasium. A poor Jewish medical student ate dinner with the Einstein family every Thursday for six years, tutoring Albert in science and philosophy in exchange. He renounced his citizenship in the German Empire to avoid military service, then entered a four-year program for teachers of math and physics at the Polytechnic in Zurich. After two years trying to find a position he went to as a patent examiner at Bern where he evaluated electromechanical devices, but more importantly continued to work on his own. He published a paper on capillary forces in 1901, four years later he has his “miracle year”: he finished his thesis and published four ground breaking papers on the photoelectric effect, Brownian motion, special relativity, and the famous relationship between mass and energy. In 1911 he postulated that light rays would be deflected by gravity, this was confirmed during a solar eclipse in 1919 which brought him to world fame and the 1921 Nobel Prize in Physics. Because his theory of special relativity was still controversial, it was his work on the photoelectric effect that was the nominal reason for the prize. He was a visiting professor at the California Institute of Technology when Hitler was elected, he returned to Europe but not to Germany, learning that there was a $5,000 bounty available for him. He joined the Institute for Advanced Study at Princeton, New Jersey, where he worked for the rest of his life. Hitler’s rise led him to turn from pacificism to preparedness and in 1939 signed an influential letter to President Roosevelt warning of German progress in creating an atomic bomb. In 1940 Einstein became an American citizen and was active in the National Association for the Advancement of Colored People. In 1952 he was offered the largely-ceremonial post of President of Israel. He had an abdominal aortic aneurysm which surgically reinforced in 1948 but it ruptured, he took a draft of a speech with him to the hospital but died the next day.